TURKANA, Kenya — Ana Mana, a lame widow, was frail, bone-thin and wrapped in a deep-blue, loose-fitting garment – but her eyes hinted at unwavering inner strength. She held her head high as she sat in the shade of an acacia tree where the sand was coarse and mixed with pellets of goat dung. For the most vulnerable, like Mana, the absence of rainfall means the constant threat of hunger. Scientists attribute these more intense droughts to climate change. But in place of scientific understanding, the pastoral tribesmen tell legends about the droughts, or “akumuw” – stories that, with the years, have grown to biblical proportions. The people name the droughts much the way Americans name hurricanes, but in Turkana, the name relates the devastation each drought brings to the land. “Lopiar was a disease,” Mana said, recalling the deaths of goats, other livestock and people. 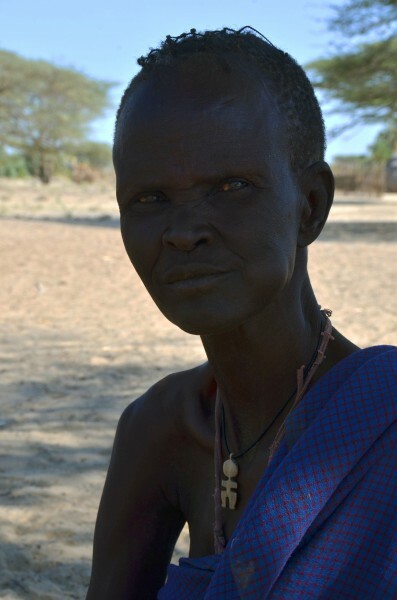 The Turkana call the current drought Atiaktiak ng-awiyei – “the one that divided homes.” It has displaced whole families, forcing them to move to other villages in search of aid or employment, or to take up residence in a refugee camp. Some villagers have attempted to survive by harvesting acacia trees to make charcoal or firewood for sale, but that has reduced the vegetation their livestock eat, said Serigne Kandji, an agro-ecologist for the World Agroforestry Centre. To curtail the rapid dwindling of resources, Kenya’s Ministry of Water and Irrigation began a farming education project in 2008 called the Millennium Development Goals, which aided participating villages and trained villagers to maintain and harvest crops. But for these long-term investments to succeed, Kandji said, the government needs to invest in a viable irrigation system that could collect and store rainwater to sustain villages through times of drought and give farming a chance. “Investment in water is needed,” Kandji said. The few regions where irrigation systems have been built have already shown a high yield in vegetation, according to a 2008 water ministry report on rain harvesting in Turkana. The study concluded that the people in those communities now look less to the skies and more to the ground, by caring for their fields and gardens. But in the lands where there are no plowed fields or water storage systems, villagers still wait for rain. And while they wait, members of Mana’s extended family share with her the little food they have.